Dexter: I'd still like to read those poems... what rhymes with Dexter? Dexter: What rhymes with Dexter? Emma: Prick. It's a half-rhyme. Q: What is the first song she plays on the record player? 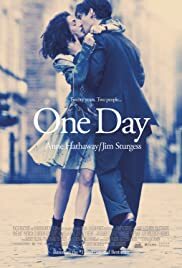 This film tells the story of Emma & Dexter, meeting at the same date, every year in their lives. People keep saying that movie adaptations from novels are usually not the same. Some are bad, some are okay, but in this case, it was beautiful. Lots of credit goes to David Nicholls for his excellent screenplay. Everything was PERFECT. Timeline, storyline and even the small details was well written. The acting was impeccable too. What about Anne Hathaway's accent? No problems there. Jim Sturgess plays the character Dexter perfectly. Most people would say that The Notebook is the top romantic teary eyed film. I tell them this: One Day is way better. It shows that two people can have friendship, loyalty, affection and love continuously. Watch it. Whether you have read the book or not, you will fall in love with Dexter & Emma !